So yesterday was a really exciting day. 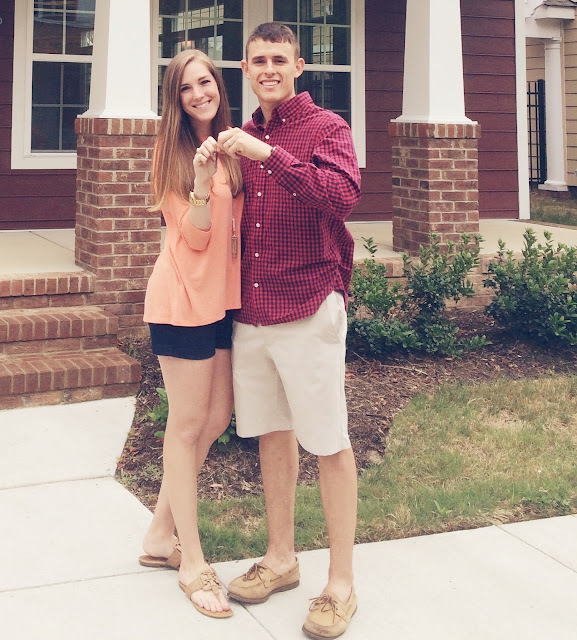 We became homeowners! 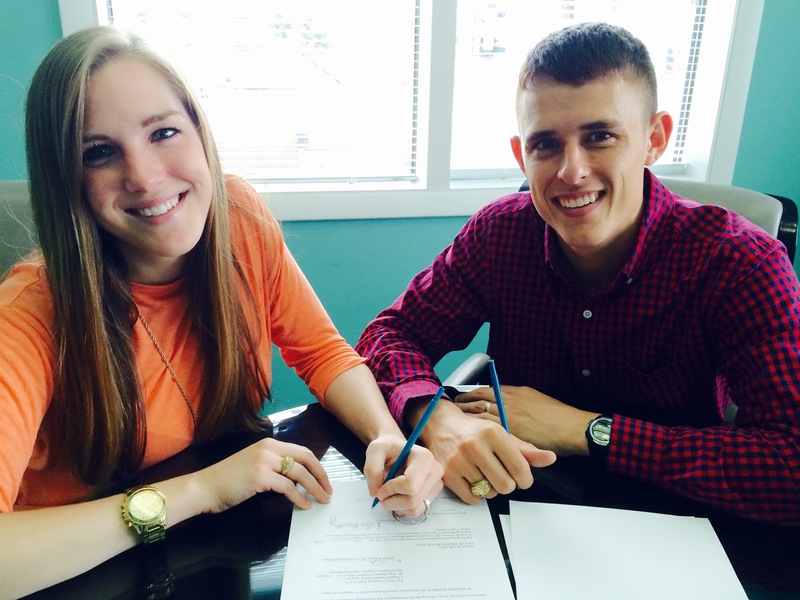 We closed on our first house and are pretty much on cloud nine. The closing process went really smoothly and was actually much faster than I anticipated. I've always heard horror stories of closing taking hours and the papers to sign being never-ending, but we were in and out of there in an hour. The paperwork was no joke though. I laughed at how pretty our signatures started out and how sloppy they were by the end. After signing our lives away, the keys were finally ours! I am excited to blog about the different house projects we decide to take on and the transformations that ensue as we make this home our own. Ironically, one of the reasons we chose this home is because it was completely move-in ready and didn't need any work done. Somehow, we have a page long list of projects we want to tackle. I think there is just something fun about making a home your own, and we are the typical overly eager first-time homeowners, so it makes sense. The first step will be to move in... yayyyy moving! And lastly, I leave you with a picture of the neighborhood peacock. Seriously. 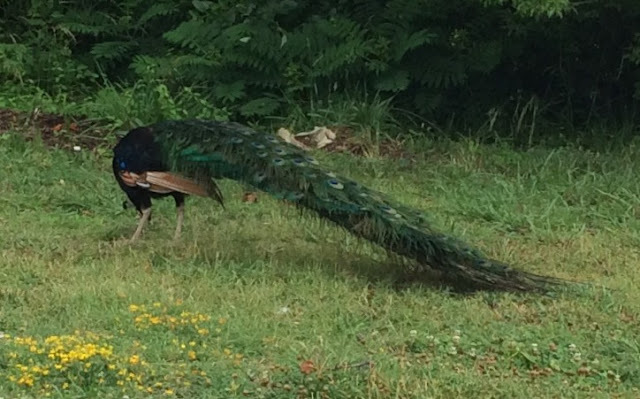 There is a guy that lives near us who has 6 peacocks, and they pretty much walk around the neighborhood like they own the place. I'd be lying if I said I wasn't really excited about hosting our family and showing them the peacocks. I mean really, how cool? Will it be cool when they are clucking like roosters in the early morning? Maybe not, but that remains to be seen. Even if they are loud, they're peacocks. They're so neat that I forgive them already. Congrats on your new home! And peacocks too! Awesome! Congrats!!! I bought our house while Mac was deployed, so I had to sign everything for both of us. I seriously thought my hand was going to fall off, haha. I am so excited for you! I had to sign with POA and that was not fun haha. Enjoy your new home!! Congratulations! It's a fun adventure! Super exciting!! Yay!! And how fabulous is that? Peacocks as your neighbours!! Can't wait to see all that you two are planning on doing!! Yay! Congratulations on your new home! It was so exciting when we bought our home. I'm really sad to be moving soon. :( Oh, as for the signature thing, be VERY glad your hubby was there to sign as well. My husband was deployed, so I had to sign for him with the added verbage explaining that it was under power of attorney. I couldn't even shorten it to POA! I had to write out "power of attorney." Needless to say, my hand was stiff by the end. Oy vey! lol! Congrats. I can't wait to see all the projects. It takes a while to make it your own. We've been in our apartment for a year and half and still added things. Congratulations! I remember signing day just being really exciting! Can't wait to see your new place! ahhh this post makes me so happy. i'm SO excited for you and parker! Yay new house! Can't wait to see more of it and how you make it yours. And that is super cool that you have peacocks in the neighborhood.